An interesting day. No internet in the Hole again, but set up shop for a while across the street and downloaded a newer build for the TV. Installed it in The Hole by tethering the TV to my cell phone. Slower than a 1600 bps modem. Or so it seemed. 10 minutes to update one app. But the newer build fixed most of the issues, and I was able to plug in an antenna and watch the world cup game. The game ended, miraculously, just before lunch time so I went back across the street, updated the bugs and had chicken marsala and strawberries for lunch. There was a Marketing 101 session going on down the hall, and a stream of very attractive humans came in for a few minutes each to show they knew how to make noises with the espresso machine. Lesson learned: when you have no engineering skills, but are pretty/handsome you can still be a barista. 100° in the car for the short ride to Hole 2 for sync and to check email. The guy who fixed the internet billing problem last time was there, he will probably call the provider tomorrow to get an updated contact. Google support has utterly failed on this. Found out the group will be moving to the next building over. Another demotion. Execs are getting the new building 2 over. I am not looking forward to the move. Called BofA to try to get the double transfer issue reversed, but they have so many blocks against helping customers I gave up. There is no way to message them online though their on-hold blather suggests doing that. Watched PTI, the new sub is pretty good. 1/3 of The Bachelorette, which made some drama where none needed to be, but they got over it. The dork she gave the first impression rose to she is now seeing is a dork, albeit a smiling, positive, tall dark and not as ugly as he could be dork. Meanwhile three of the guys not picked for a date are feeling way more insulted than they have any right to be. The two who are taking it in stride are probably going to go to the next round, which is her meeting their families at their homes. Watched Channel 7 news. Lots of fire news because they have a drone, but also a lot of real local news. Sports news was handled well. Not a lot of coverage of the Thailand cave rescue, but the network was doing something in-depth later tonight. Seeing the news online made me cry. 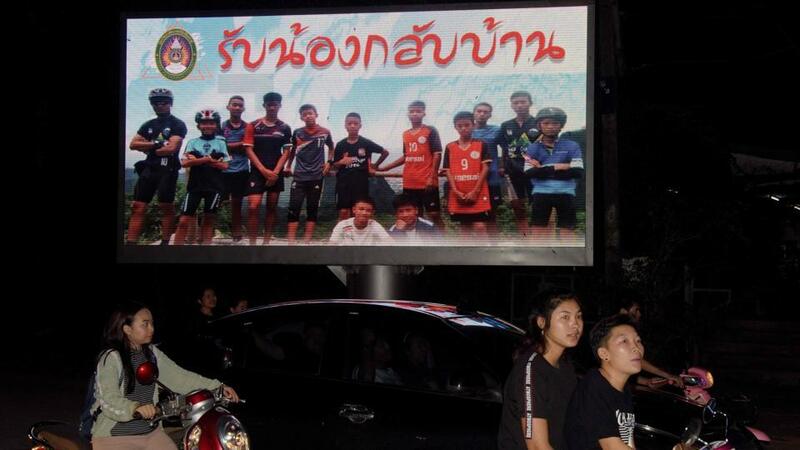 CBC had a photo of a billboard which showed the kids, and hand written huge above it was "rahp nong glahp ban" which they translated as "welcome home boys" but it's really "receive younger brothers returning home". It sounds a lot more poignant in Thai. "They now belong to the world" one newscaster said. Dinner was chicken soup with matzo balls and shrimp won tons. 3/4 of a slice of black forest cake for dessert. Somehow I resisted the urge to make a la mode. Poured out half the sourdough starter in the fridge and fed it. The poured-out half is in a container, will try again with pancakes probably. Thicker batter this time. Call Vanguard to find out about IRA withdrawal to cover the double BofA debit. It's either that or sell Apple stock. Boss wants me to train NP on Netflix testing. I really don't want to do that in Hole 2.